On April 6, 1945, Second Lieutenant Takashi Komecha took off from Bansei Army Air Base as a member of the 62nd Shinbu Special Attack Squadron and died in battle at the age of 22. On the same day he received a special two rank promotion to Army Captain, and he was granted medals for the Order of the Golden Kite 3rd Class and the Order of the Rising Sun 5th Class. He was born on March 7, 1923, and was from Amagasaki City in Hyōgo Prefecture. In September 1943, he graduated from Ōsaka College of Foreign Languages. During his time there he had aircraft pilot training at Kansai Flight Training Center. Upon graduation, he started at the company of Mitsui Bussan, and the next month he entered Mito (Sendai) Army Flight School as a trainee in the 1st Class of the Special Cadet Pilot (Tokubetsu Sōjū Minarai Shikan) Program. In March 1944, he joined the Philippines 3rd Flight Training Unit in Lipa. In June 1944, he was appointed Second Lieutenant, and in August of the same year he was assigned to work at the Shimoshizu Flight School Chōshi Branch Unit. In March 1945, he became a member of the 62nd Shinbu Squadron when formed at Shimoshizu. 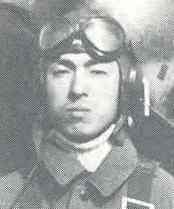 His squadron proceeded to Ozuki in Yamaguchi Prefecture before flying to Bansei. Even though in the mountains the plum, peach, and cherry blossoms are blooming, I want to tell you that I am bearing great sorrow. During a move to another base, we lost our squadron commander, who we relied on as both a staff and a pillar, and Second Lieutenant Sugita. My writing this is the best that I can do. Nevertheless, I am not the same Takashi who has been up to now. Even though the squadron commander loses all of his squadron members, I will not flinch. Being here for twenty days, accepting bravely all adversities, I have come to fight. Even whatever hardship there has been, I have been glad. This is a life that has a purpose. I will make a crash attack holding the remains of my squadron commander. While for a long time I have depended on your great kindness deeper than the sea and higher than the mountains, I cannot do even one act of filial piety. My dying is unfortunate, but somehow please forgive me. Thank you for what you have done for me for so long. I will rent a room in heaven a short distance from you and will be waiting for you. Please excuse this hastily written letter. Komecha's last letter shown above was displayed at Yasukuni Shrine on New Year's in 1982, and many visitors were greatly moved by its words. The letter is also famous for being displayed at the War Exhibition sponsored by the Yomiuri Newspaper Company. Now it is displayed on the second floor of the Bansei Tokkō Peace Museum. It is as pleasant as can be here at a certain base at the southern tip of Honshū, where the cherry trees are blossoming and there is a trace of coolness in the spring breeze that caresses the sea's surface. At the time when all life in the whole creation sprouts forth, I am filled with enjoyment of everyday life. We are beginning our final rigorous drills. While we weep for the people's compassion toward us, from the bottom of our hearts we must achieve a great battle success. I am glad that at Kakogawa I was able to see everyone just when I thought that I might not be able to meet them. While I was thinking that during that time I would like to talk with them about various things and also give my thanks, it is regrettable that when I met them I could not express one word. The newspapers and other media are here, and it seems that the situation has become more and more serious, but we surely want to fight free and easy with calmness. You probably are counting the days to my battle success. Please wait free of cares. We at the base here lost Second Lieutenant Suzuki's plane, and we lost an air transport plane that came here. Suzuki faced the fate that afflicted him with the reality of unconsciousness. For me I will remain calm no matter what adversity comes against me. The destruction of aircraft and the death of comrades are usual for aerial work. Victory or defeat is the custom for soldiers, and they have the spirit that they can overcome whatever comes about. During the takeoff at Kakogawa, it was my heart's desire that you could see my waving of the plane wings to you. I ask whether my letter arrived. I will be praying for everyone's health. His thinking seems to be that peace will be achieved by winning the war against the enemy attacking Japan. The two letters, poem, and other information on this page come from Naemura (1993, 100-1). Axell and Kase (2002, 137-8) include a translation of Komecha's first letter above. Their translation is less literal than the one on this page, but they capture the same basic spirit and meaning. They explain that Komecha was part of more than 500 Special Attack flyers who received posthumous decorations from the Japanese government in 1966. He received the Order of the Golden Kite (called "Golden Eagle" by Axell and Kase), an award for bravery in battle.